Oh yes, it’s true everyone, today I had a burger. Once again we were out and about at lunch time, so we stopped in at a pub that we haven’t been to for a long time, and had a pub lunch, which for me consisted of Burger and chips (it also came with a beer, but I substituted the beer for a Coke Zero lol). And you know what? It was freakin awesome! Yep, it was bad food, but god did it taste good. I have to say that I’ve really enjoyed the food that we’ve been having on the 12WBT, but there is something very comforting in going back to good old pub food. So having said how awesome it was, I should also say, I didn’t eat the whole thing. 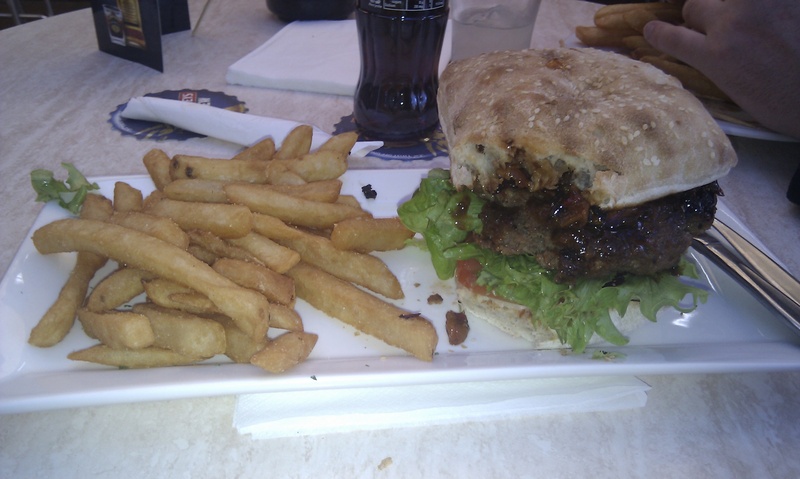 This burger was enormous! I don’t think I ate even half of it. I also only had a few sneaky chips that were served with the burger. And to be honest, I really didn’t enjoy the chips. All I could taste when I ate them was fishy oil and it made me feel sickly. But god, that burger. MMMMMM.